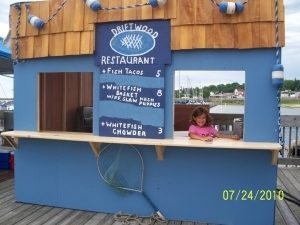 The Driftwood Restaurant is the number one choice for catering in the St. Ignace area. Our professional catering team has over thirty years of experience and will help you plan every detail of your event to ensure it is exactly what you envisioned. We can accommodate any size group and can provide a customized menu to suit your needs. Some of our more popular items are our award winning Wing Dings, fresh Great Lakes Whitefish, Prime Rib, tender Pot Roast, homemade Soups and Salad Bar and make your own Sandwich Station. We have a great selection of breakfast, lunch, dinner and hors d’oeuvre menus offering a variety of our specialties. We look forward to working with you to make your event special Call soon for pricing and to reserve your date!